Foreign investment needs to be a high-priority area for growth and employment generation in Sri Lanka, said Arun M Kumar, Chairman and CEO, KPMG India. “India has set an example in the neighbourhood. With progressive FDI policies and an activist approach to inviting investment, India has become one of the largest destinations of foreign investment,” he said. Private sector investment has remained constrained because the business environment has not been conducive and the public sector has played a dominant role in the past. Since the government’s budgetary resources are limited, the private sector is expected to play a larger role in infrastructure development through PPPs, he said. Policies to improve the investment climate, complemented by upgrades in the quality of infrastructure and human resources, need urgent attention to catalyze domestic investment and attract FDI. “Breaking from the past, Sri Lanka’s new Inland Revenue Act, approved in October 2017 aims for a transparent, unified, and even-handed legal framework. Consistent implementation of this new rule-based system could help unlock long-term investment decisions. More generally, it is vital to cut the red tape hampering businesses to attract greater FDI from a various sources,” he said. According to him KPMG India has worked extensively with the Governments of various states in India in the area of investment promotion. 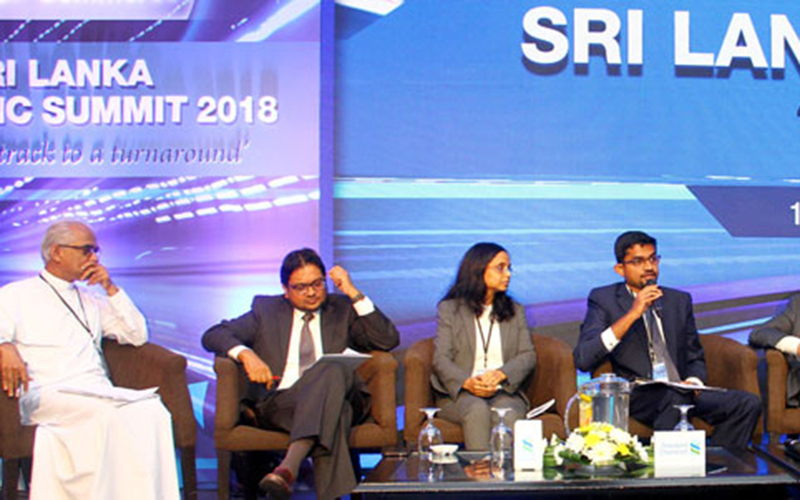 Sri Lanka could adopt best practices from the various states’ investment promotion boards to restructure Sri Lanka’s Board of Investment, towards purely promoting FDI and away from regulating FDI and managing export processing zones. Ease of doing business is increasingly a key diagnostic parameter for global investors today. In India, KPMG has been working actively with India’s Department of Investment Policy and Promotion (DIPP) as well as with many states to help measure and improve Ease of Doing Business. “India, as you all would know has made a remarkable improvement in its ease of doing business rankings this year, a 30 – place jump, higher than any other country,” he said. This jump was driven by improvement in many parameters like construction permits, paying taxes and insolvency resolution. Most importantly, it is the relentless implementation and on-ground results which made all the difference. Highlighting the need to make the agricultural sector more productive, he said that post harvest losses in the country ranges from 18-42%, depending on the product. He said, Sri Lanka has not been successful in implementing a system of plastic crates just for the movement of agricultural produce, nevertheless, other countries in the region has significantly improved the agriculture productivity in terms of delivery of goods using this simple technology. “We are not able to do that simple thing. It’s a simple micro change that can make an enormous difference in the economy,” he said. Commenting on less productivity in the public sector in Sri Lanka, he said Sri Lanka has replaced the competent public sector by appointing much less competent people to various positions and this has significantly lowered the overall productivity and led to increase the levels of corruption at every level of the sector. “That is actually hurting simple reforms in this country,” he said, Noting that we live in a broken system, he said further that most private sector companies in Sri Lanka as well as policy makers, researchers and international lending organizations such as IMF has learnt the art of surviving in this broken system. “We survive in a broken system. It’s like surviving in a gorilla community in which rules don’t apply and everybody tries to be the biggest gorilla. In this system anybody can manipulate the political gorilla and build the system to work just for them and everyone works for their own self interest,” he said. To break this manipulative system, he suggested that everyone including private public sector individuals and civil societies need to find a collective way of fixing the loopholes in the existing system. “Or else there is no other way to solve it. For me, Sri Lanka seems to be very good at living in a repetitive cycle,” he said. And to realise the true growth potential of the economy, he stressed the need to understand existing and foreseeable challenges and to come up with proactive policy measures to rectify those issues and to garner better economic benefits. State Minister of Finance and Mass Media Eran Wickramaratne said the government wouldn’t divert from the path of its ongoing fiscal consolidation measures and would take further necessary steps to achieve set growth targets of Sri Lankan economy. According to the minister, there are two exogenous factors generally impact Sri Lanka, which include unpredictable weather patterns and escalating fuel prices. “In 2015, our budget deficit as a percentage of GDP was in excess of 7 percent, the present government managed to bring it down to 5.5 percent and we are hoping that it will go below 5 percent in 2018,” he said. Nonetheless, he said that adverse weather impacted over 20 districts in Sri Lanka in 2017 and it was one of the reasons, the government deviated somewhat from its fiscal consolidation efforts. The Minister also said Sri Lanka has gained significant benefits from original Indo-Lanka trade agreement more than India has. According to him, Sri Lanka has been increasing its exports over the years and said the government is confident that the Economic and Technology Co-operation Agreement (ETCA), a diplomatic arrangement that seeks to add to the existing free trade agreement between India and Sri Lanka, primarily in relation to trade-in services and the service sector will be further expanding this scope. Commenting on Sri Lanka -Singapore FTA, he said that the country needs to begin inking much needed trade links especially with East while making more trade integration with South Asia. “There is no other way for this country unless we are ready to compete. Our market with a population of 21 million won’t make any huge difference to the living standards. We have to access larger markets and also to be the gateway to the South Asian market,” he said. He however noted that FTAs are not going to increase Sri Lanka’s exports immediately. He also publicly accepted that there are hiccups in the implementation of the Inland Revenue Bill and also noted that Sri Lanka is moving towards rule based system, taking discussions away from politicians and bureaucrats.